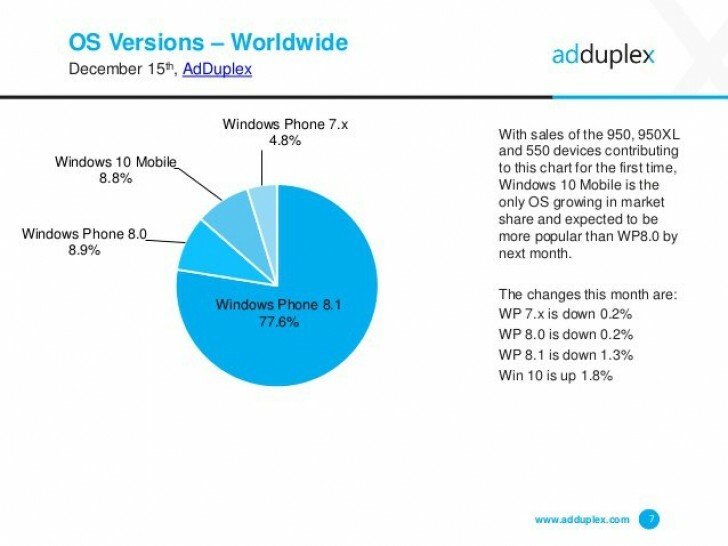 AdDuplex released its monthly report showing Windows Mobile distribution and a snapshot of the data from December 15 shows Windows 10 mobile is slowly but surely making progress. The sales of Microsoft Lumia 950, Lumia 950XL and Lumia 550 last month have bumped the Windows 10 mobile usage by 1.8 percentage points bringing the overall share to 8.8%. Windows Phone 7.x and Windows Phone 8.0 are down 0.2 percentage points each, while Windows Phone 8.1 is down 1.3%. Additionally, AdDuplex data for December shows some new devices that are yet to hit the smartphone market. One of them is the Lumia 650 (RM-115(x)) with a 5" 720p display. The other new one is RM-1160/1162, which packs a 5.4" 720p display, for which we anticipate more information in the near future. The report suggests that LG and HP are preparing new devices. LG will have a LG V496 (LG G Pad 8.3 in the Android realm), but repurposed to run Windows 10 mobile. As for HP, the company is preparing the Falcon with a 5.4" 1280x768 pixel resolution. We recently saw the device in a benchmark setting to pack a Snapdragon 820 and a QHD resolution on a 5.8" display. Hopefully, we'll have final specs for HP's upcoming Windows flagship soon enough. Its dead forget it....I went back to android i love using all these apps. Texting and calling got a big boring lol. Ubuntu? Mint? Arch? Damn Small? Backtrack? Canaima? Red Flag? BSD? Unix? Puppy? LinDows? Kali? Fedora? Red Hat? any of the other zillions of forks?